Food is often a focus of communal and community events, and in many kitchens, it is a time for remembering and reviving culinary traditions. With Street Feast falling on Ramadan this year it’s great to be aware of those in your community who might be observing the tradition. With the help of our friends at Under One Tent, we’ve created a guide to help you host your own Iftar celebration. You could make your Street Feast into one or you could even have one the week before. It’s a wonderful excuse to feast into the night! Iftar is observed during the holy month of Ramadan. It is one of the oldest rituals followed by Muslims all over the world. Ramadan occurs in the ninth month of the Islamic lunar calendar during which the Islamic community fast during the day. They have a meal before dawn and end the fast in the evening with this special meal. This evening meal is known as Iftar which, as a discipline, is taken after the sunset, when those observing Ramadan break their fast by eating a date or other small snack and drinking water or milk. The timings of Iftar differ according to the time of sunset in the area. Ramadan ends with a big feast called Eid al-Fitr. In the month of Ramadan, Iftars are held amongst families and friends to share the reward and blessings of sharing food and prayers together as a community. 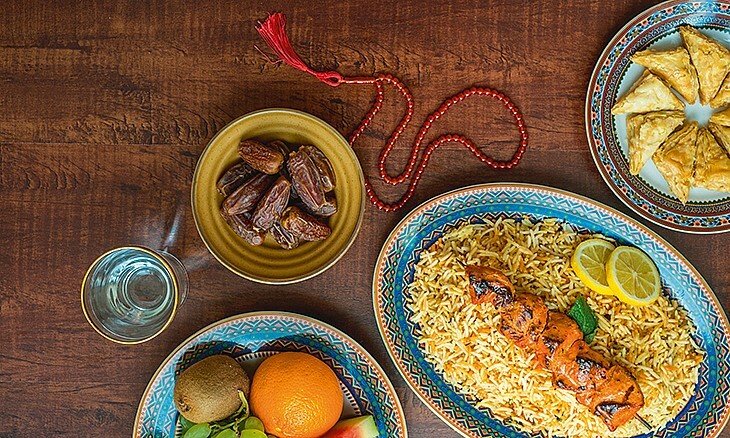 Here’s what to think about when hosting an iftar. Place for prayer: A space should be kept separate for prayer for men and women. The space should have prayer mats or clean flat sheets laid out in the direction of the Qiblah. (Qiblah is the direction of the Kaaba in Mecca, a building at the center of Islam’s most important mosque.) Extra scarves and shawls should be provided for the convenience of women to read their prayers. A chair or two could be pulled up for seniors. Separation of space: When you host an iftar, remember you need the ability to keep a separation of space for praying and eating for men and women to give comfort to everyone. Iftar: The menu for Iftar should include dates as they are most common way to break one’s fast. Follow with a drink of water or roohafza milk- a rose flavored milk drink, or a warm harira- almond milk drink (milk and almonds give strength to somebody after a day of fasting) or anything to quench thirst. Remember to keep a good supply of water handy; it’s your main entree. Menu: Different cultures have different food they traditionally share as the main meal, but it should include an assortment of protein and carbohydrates to nourish those who’ve been fasting. In the south Asian and Indian cultures fritters seasoned in a yogurt called dahi vada is a common dish. Yogurt helps calm an empty stomach but carbohydrates are a must, so other favourites like curry puffs and samosas are a great option. Fresh fruit like watermelon or a fruit salad or fruit chat (spiced or seasoned fruit) can also be served since fresh fruit of course is healthy nourishment. Avoid drinks like lemonade or orange juice as it’s not comfortable to have anything acidic after a day of fasting. If you are serving meat it should be halal. Sweet dreams: Tea and coffee are popular after the main meal and are often served with sweets. Check out our Sheer Khurma recipe for a lick smackin’ sweet treat traditionally shared on Eid al-Fitr. And there it is! What a wonderful way to strengthen connections with others. Guests of different ages, cultures, regions, languages, all fast as equals, share food, prayers and blessings with each other. Ending with a sense of contentment, camaraderie and harmony; you know it’s been a successful iftar. 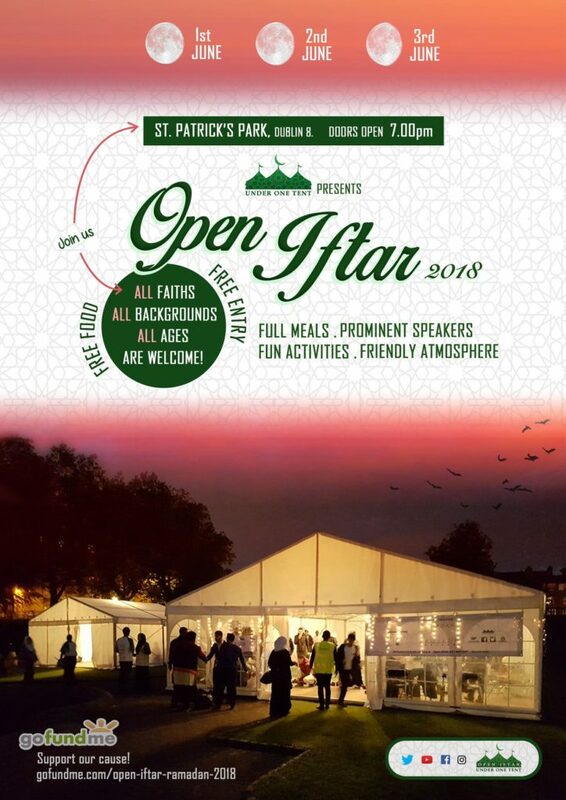 If you happen to be in Dublin on June 1st, 2nd or 3rd, our friends at Under One Tent are hosting an Open Iftar at St Patrick’s Park and are inviting the whole community to join in. We hope to see you down there!